The Superior Court of Humboldt County and the Yurok Tribal Court formed a new Family Wellness Court to help parents end their substance use—an underlying issue of many child abuse and neglect cases—and ultimately reunite them with their children ensnared in the child welfare system. In response to the opioid epidemic, this collaborative joint-jurisdictional court is an alternative to the traditional justice system, overseeing juvenile dependency cases and offering a rehabilitative path for parents struggling with addiction. In 2017 alone, roughly 1.7 million people in the U.S. suffered from a prescription opioid abuse disorder, according to the National Institute on Drug Abuse. California’s Department of Public Health lists Humboldt and Del Norte counties as having some of the state’s highest opioid death rates. Native Americans are the most impacted by overdose-related deaths than any other group in the U.S. According to the Centers for Disease Control and Prevention, the number of overdose deaths among Native Americans living in rural areas increased by 519 percent between 1999 and 2015. Tribal Court Chief Judge Abby Abinanti and Humboldt County Presiding Judge Joyce Hinrichs preside over Family Wellness Court, jointly overseeing cases and working closely with families and a wellness team—tribal mentors, family members, mental health specialists, and county social workers—to design a wellness plan specifically tailored for the families who participate in the court program. Family Wellness Court participants and the wellness team create specific, measureable, attainable, relevant and timely (S.M.A.R.T) objectives and meet regularly to empower and ensure the family is meeting its goals. Participants can take a year or longer to complete the program. “What makes this court special is that the families have a say in their wellness plan and that’s empowering,” said Jenny Walter, an independent consultant who helped design the court program. While wellness plans vary, families who participate in this voluntary court have access to services and community networks, including tribal mentors who are specifically matched to the parents; access to a “community connection” tool that helps parents learn about their tribal heritage and ways to connect with the tribal community; and what the court calls “mapping services,” which includes tribal and non-tribal services such as family coaching, education, and job placement. To be eligible for the Family Wellness Court program, at least one parent must be a Yurok member; parents who are struggling with a substance use disorder must want to participate in court program; and the child who is the subject of the juvenile dependency case must also be Yurok or eligible for membership and five years or younger. Five families have participated in the court program since it launched last July and now more state and tribal court leaders are in the process of implementing their own family wellness courts. 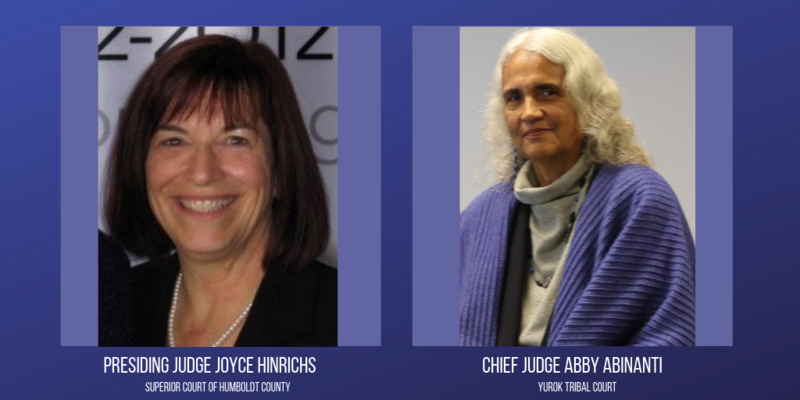 Following Humboldt’s lead, the Superior Court of Del Norte County also worked with the Yurok Tribal Court to establish a family wellness court for Yurok families living in that county. Soon, the same court program will be accessible to Karuk and Hoopa Valley tribal families living in Humboldt and Del Norte counties. The Family Wellness Court is the second joint-jurisdictional court ever created in California, and one of 50 projects funded by a Judicial Council grant program to fund innovative projects in the state’s trial courts.